To begin, I must make a post-congratulatory statement to Katie and Jason on their nuptials. Congrats kids! Welcome to The Marriage Club! First project: The Wedding Shower Gift. Every invitation included a letter. 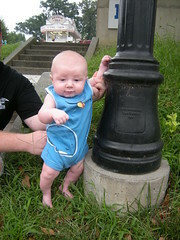 My letter was L. Lamp? No. Laughter? A little too “Uppercase Living” for me. Leftovers? Yes. Legos. YES. Legos won. 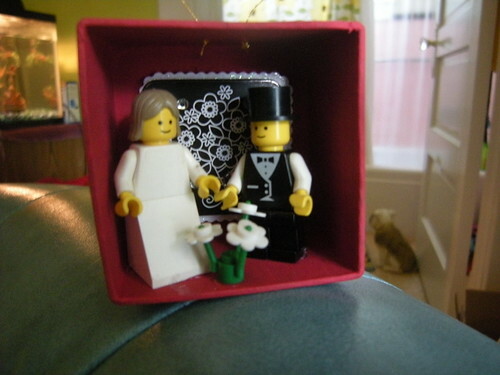 So I ordered these little guys on e-bay, got them just in time to make their present… WTF am I going to do with a Lego bride and groom?!?! Unfortunately I couldn't custom order a Lego Cop and Bride. Had to settle for Bride and Groom. The bride and groom are glued to the paper mache box. I had some other pretties to glue on, but they just didn’t look right. Something about Legos and rhinestones don’t mix. And yes, Katie and Jason looked just as smashing as their plastic counterparts. Katie willingly provided shirts from her and Jason’s closets. 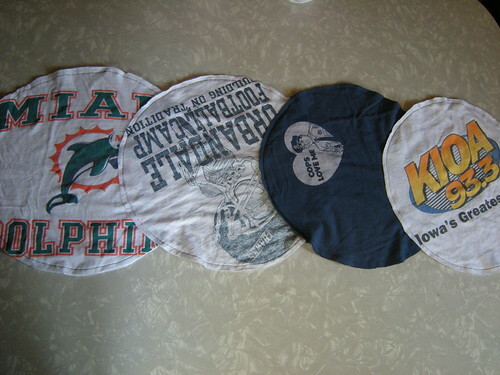 I had to pry some of them out of my husband’s hands because they were awesome shirts. The newlyweds are getting a slew of projects Generation T Beyond Fashion. The book rates each of these a Level 3, of 5. That’s totally correct. These were harder than they looked. 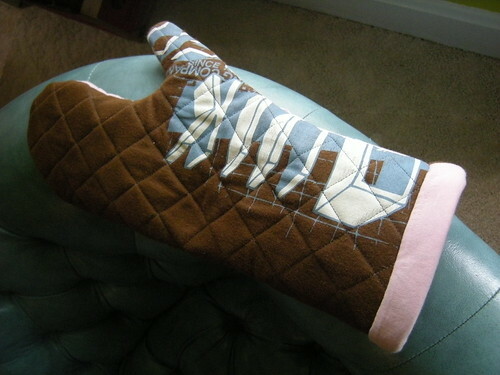 The idea of “quilting” on knits is tough because the fabric stretches. 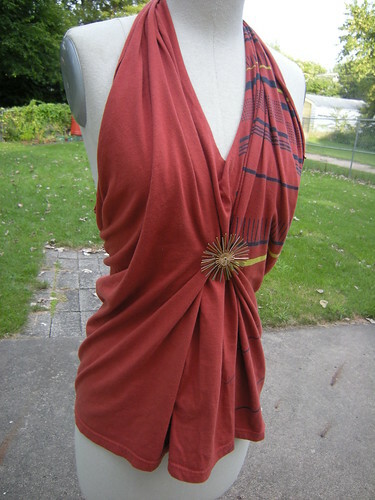 I changed up the pattern a little – instead of layers of t-shirt/knit in the middle I used leftover flannel. These were fun too! 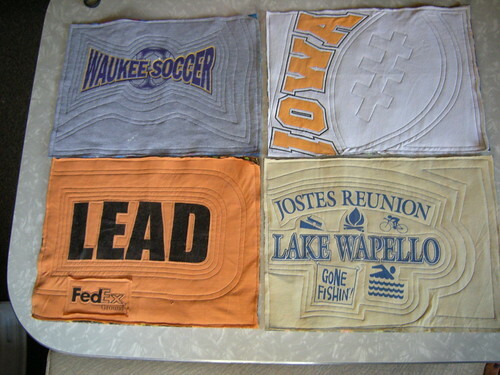 These were actually easier than the place mats. It wasn’t until after all four place mats, and all eight coasters that I decided to Google and find out why my thread kept breaking. I thought it was the crap thread, but the good stuff was doing it too. Turns out you need a big needle for knits. Well. Now I know! I LOVE THIS!!! 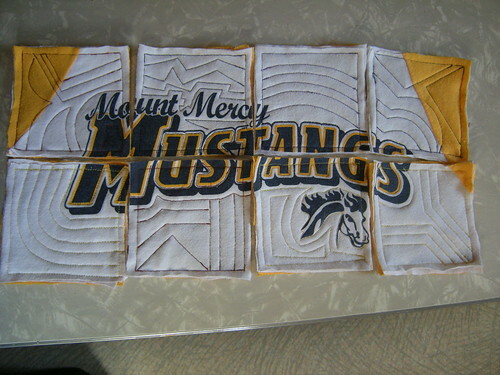 This is a table runner. To be put on a table… or end table… or anywhere you see fit. I tried to switch up the directions – but also had to make sure I wasn’t covering anything important (such as the “Cops Love Me” graphic). 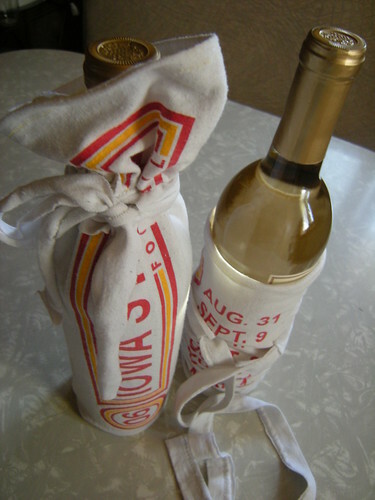 Wine bottle holder . Awesome and fun. Go team! These are great, I want to make a bunch just to have on hand in case we need a gift. The T-Shirt Extravaganza 2010 has begun. Obsessed might be an understatement. As I’ve mentioned, I love every project in Generation T: Beyond Fashion. Brian and I were trying to come up with a fun, creative house-warming gift for some friends. We decided that we would make something out of t-shirts, so we dug through Brian’s extensive t-shirt collection and found some goodies. 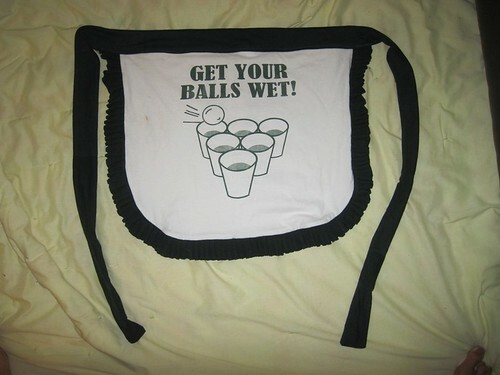 Brown and pink tees for an oven mit, and an extra special white t-shirt about balls, and a green tee to match for the apron. 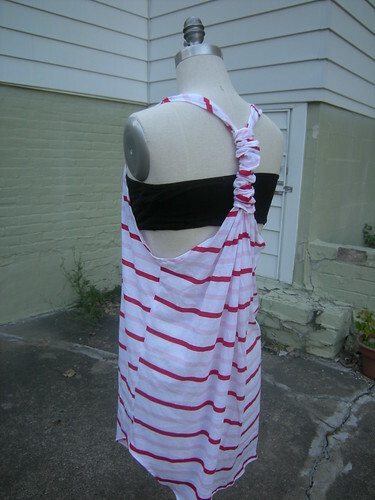 The apron is a variation of Central Cooking, project 41 in Generation T: Beyond Fashion. 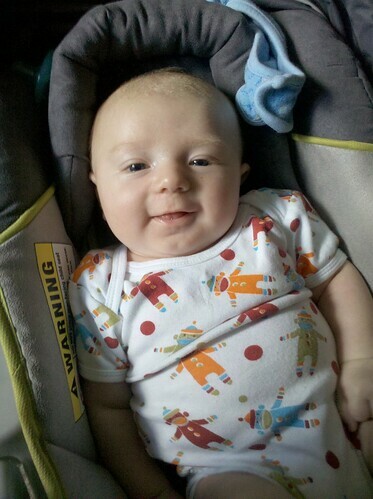 The pattern is one-sided, but I opted to make it reversible. I sewed the ruffles on one side, ruffles pointing to the middle, then attached the “back” (front sides facing together). Turn inside out and perfection ensues. 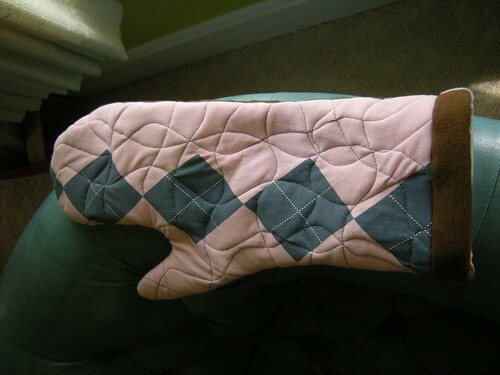 Glad I consulted my mom before starting the oven mit. The recipe calls for regular batting, but my mom told me to get the good insulated stuff specifically designed for oven mits and likewise items. This is Up in My Grill, project 40 in Generation T. I made a second one for Brian. All the mits, strategically placed on one t-shirt. This is the brown side. The pink side. As you can see, this side is argyle. On the first one (not shown), I tried to "quilt" on the argyle lines... but knit is tricky. It didn't turn out well. So on the gifted mit, I made swirly lines. These are totally sporadic. Close up of band around wrist. Brian and I were very pleased how these turned out, it was tough gifting them! But I think recipients Joe and Betsy really enjoy them, so it really all works out. I need to tweak the pattern a little, make the hand a little bigger and make the arm a little shorter. There are two layers of t-shirt on each side. 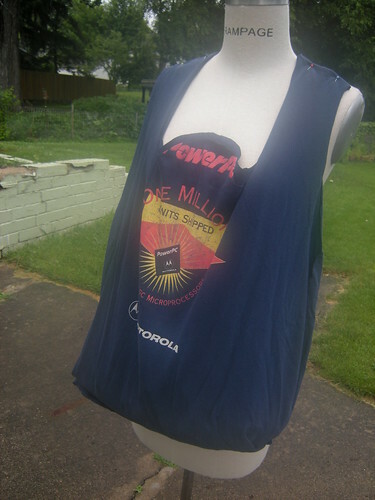 I haven’t used the oven yet to try the mit out, but I may consider taking a layer of t-shirt out to cut down on some of the bulk. 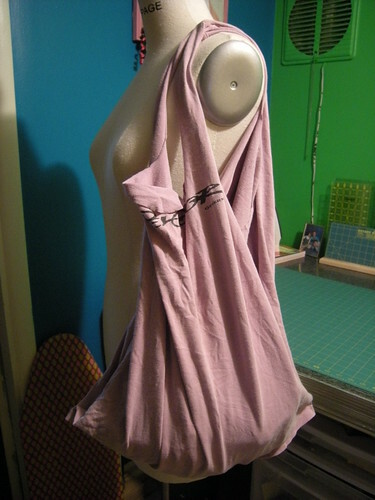 I also made a quick, new-sew halter top for myself! This is Pinup Girl, project 1 in Generation-T. 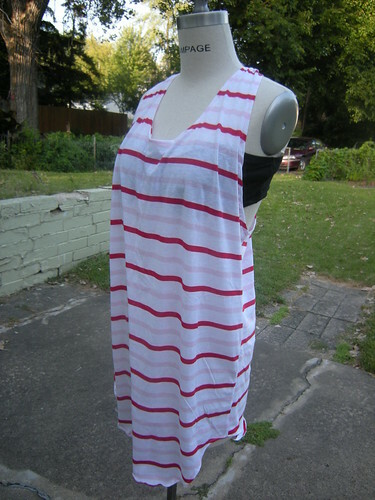 This consists of cutting off one sleeve, then cutting the neck hole and other sleeve in a / line. Put the shirt on, putting your head through the arm hole. 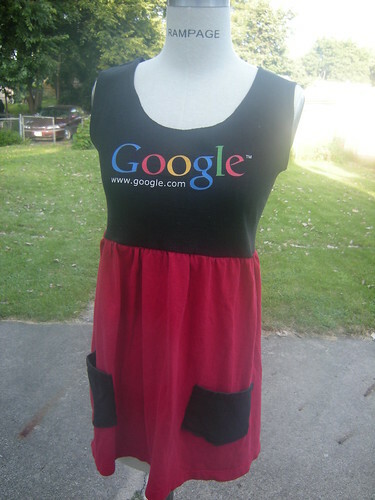 Should be extra fabric in the back, so pill that forward and pin it. This would make a GREAT maternity shirt, if it were like 7 inches longer. 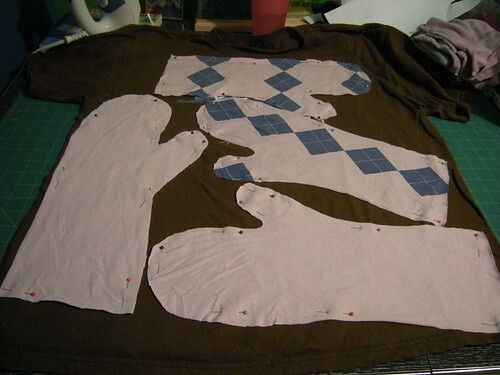 The trick to this pattern is to find a t-shirt with a full design on the front, and possibly the back. If you choose something with a small design, it might not show. Happy Independence Day Weekend! Today is Monday, July 5th and I am proud to say that I have not left my house today. I got some major sewing done this weekend, so I’m really not complaining. Plus it’s super humid out and my knee hurts, so I didn’t get to run over the holiday (the only bonus to injuries is more time in front of the sewing machine). 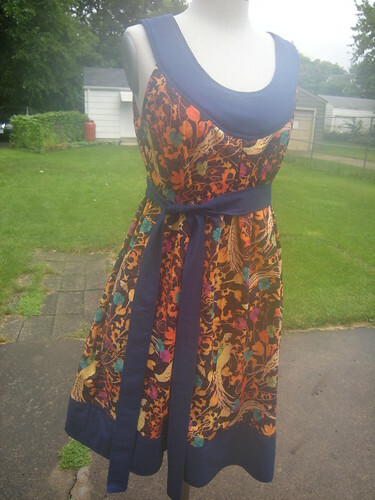 First up, a second dress from McCalls 5659. This one is a little different than first one (see previous post). I skipped the visual pockets and put side pockets in. Also a band at the bottom. I love this! The fabric is a little out there for me – there are Hawaiian looking flowers in pink and teal – I just don’t know about them. But overall it’s great. And my husband really likes it! The blue one is from a long-sleeved t-shirt my brother gave me about 13 years ago. It’s stretched and worn, and totally soft now. I haven’t worn it in years, and didn’t have any plans to add it to my rotation. But now it’s back. 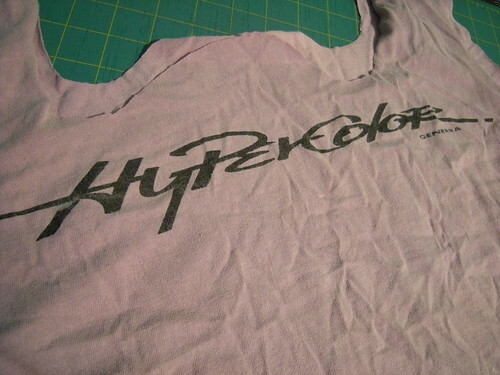 However, the next one trumps the old favorite t-shirt because its a flipping HYPERCOLOR T-SHIRT TOTE BAG. Seriously. I went from being cool, to ultra cool. 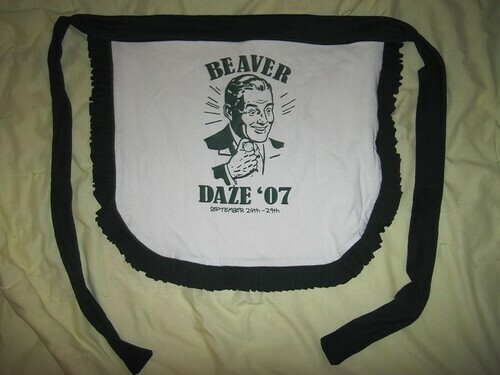 And I’m using this as my new purse. Up close and personal. See, it's the real thing. 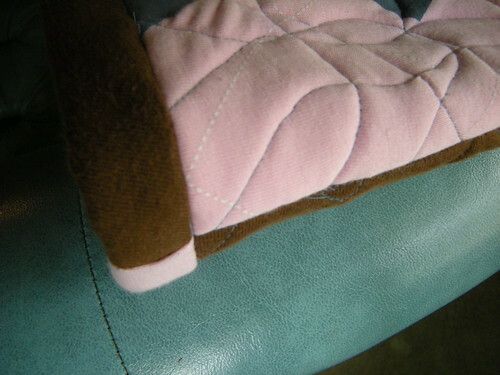 You can see in this photo that there is no stitching around the handles. Awesome. Knits don’t ravel. I love them. Manne modeling. This is the coolest tote bag/purse in the whole world. Go. 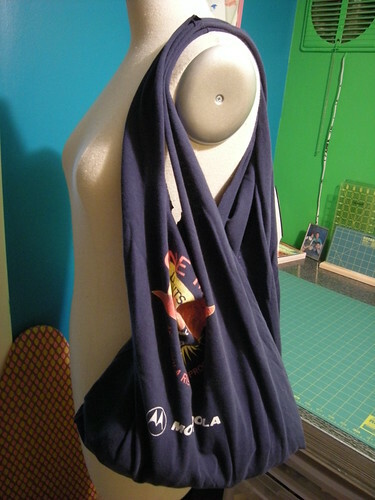 Make your t-shirt tote bag now, you don’t even have to buy the book – instructions are here! Also, this project takes like 20 minutes!